The National Chairman of the All Progressives Grand Alliance, APGA, Victor Oye, on Wednesday, dismissed the insinuation that the party is supporting President Muhammadu Buhari for the 2019 presidential election, insisting that the party has a presidential candidate that is capable of winning the election. Oye’s reaction came on the heels of the ongoing flourishing relationship between the president and the state Governor, Chief Willie Obiano, which has resulted in several trips with the governor. Also there is the story of the party using the support to appreciate the President for allowing a free and fair poll in the 2017guber election in the state, instead of taking the side of APC’s candidate, Tony Nwoye. 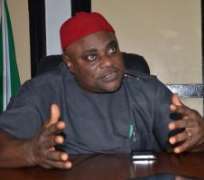 Addressing journalists in his country home of Amawbia, Awka south local government area of Anambra State, APGA’s National Chairman described the party’s flag bearer, Rt. Gen John Gbor as one of the best presidential candidates in 2019 race. He dismissed the rumour that APGA is working for APC as claptrap saying the party is committed to ensuring its victory in the 2019 polls. He added, “APGA has chosen a presidential candidate in the election, General John Gbor and his running mate, Jerry Chukwu eke, an international businessman. “Our presidential candidate is a PhD holder in Anthropology. We are working to market him, and he is highly accepted in the whole North Central. “He is a man without any blemish as far as Nigerian politics is concerned. He was a director of the Army Elite Corp. That’s not a small feat in the military.